Sikkim Now connected with rest of India. 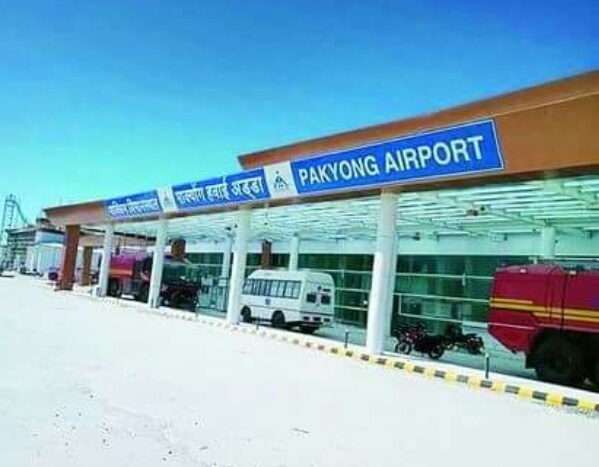 Air availability with rest of India was opened for landlocked Himalayan state Sikkim when a SpiceJet plane from Kolkata turned into the principal flight to arrive on its dirt on Saturday. Join Indian Army Upcoming/Next/ Fourth-Coming Army Soldier Recruitment Rally Schedule for West Bengal, Odisha & Sikkim States under HQ RTG Zone Kolkata from September 2016 to February 2017. Direct/ Open Indian Army Sena Bharti Rally Schedule chart for Paschim Banga, Orissa & Sikkim Rajya . Bharatiya Sena Sainik Bharti Rally schedule 2016-2017 under HQ RTG Zone Kolkata Zone (Army Recruitment Office– ARO Siliguri, Sambalpur, Gopalpur, Berhampore, Cuttack). Check details. 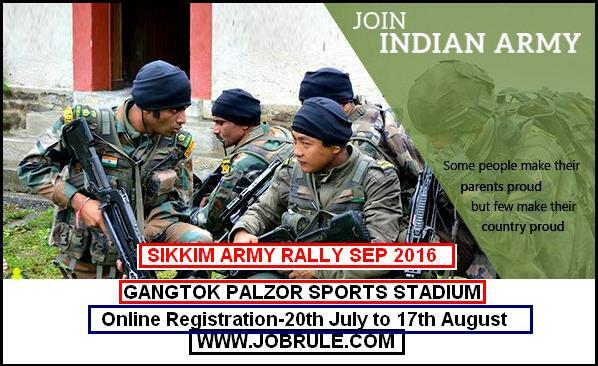 Upcoming/ Next Join Indian Army Soldier Recruitment Rally at Sikkim Palzor Sports Stadium on 3rd September to 10th September 2016 for the districts of North, East, South & West Sikkim of Sikkim State. Army Recruiting Office-ARO Siliguri, under HQ RTG Zone Kolkata invites Online Application form to recruits Indian Army Soldier General Duty, Soldier Tradesman, Soldier Technical, Soldier Clerks/Store Keeper etc trades by Sikkim Gangtok Palzor Sports Stadium Direct/Open Bharatiya Sena Sainik Bharti Rally September 2016. (Pre- Rally Online Registration is Mandatory). 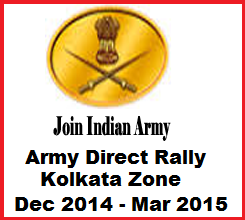 Army Direct Rally Programme Chart for West Bengal. Next Army Rally Schedule for Odisha State. Upcoming Indian Army Sainik Bharti Rally in Sikkim. Join Indian Army (HQ RTG Zone) Kolkata Zonal office (Army Recruiting office-AROs -Berhampore, Kolkata, Siliguri, Cuttack, Barrackpore, Sambalpur & Gopalpur) next direct Rally schedule. Indian Army going to recruits thousands Army Soldier General Duty-GD, Soldier Tradesman, Soldier Technical, Soldier Clerk/Store Keeper Technical (Sol Clk/Skt), Soldier Nursing Assistant-NA etc in West Bengal, Odisah & Sikkim states. 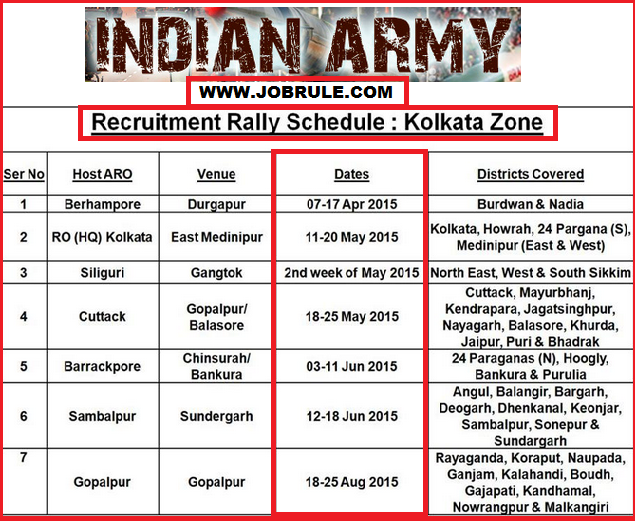 Check upcoming army rallies schedule for the month of April/May/June/July & August 2015 in West Bengal, Odisha & Sikkim States. Chart collected from Indian Army Official website. (Proposed dates & covered districts may be change on later time). 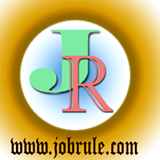 For more details or current news updates simply like our Jobrule Facebook Page and keep touch with us always. Best of luck ! Join Indian Army in West Bengal & Orissa. 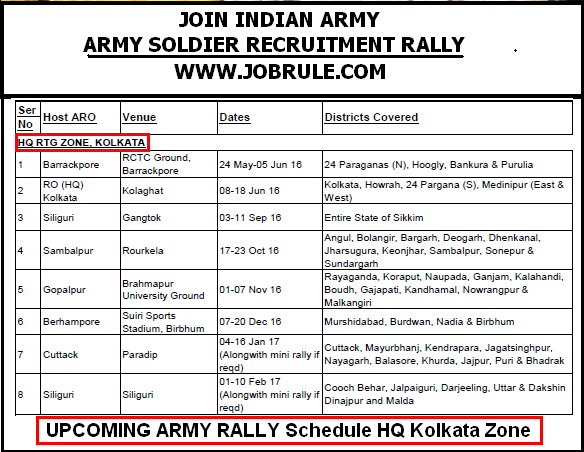 Army Recruitment Zone (RTG HQ Kolkata) going to conduct many Direct Sena Bharti Rally in the month of December 2014, January 2015, February 2015 and March 2015 in Odisha and West Bengal states. Army Recruiting offices are ARO Gopalpur, ARO Cuttack, ARO Sambalpur, HQ Kolkata, ARO Berhampore, ARO Siliguri. Military Sainik Selection Rallies (Upcoming) in West Bengal and Odisha (Tentative Dates, Venue & Schedule-district wise). Army Soldier General Duty-GD, Soldier Tradesman ,Soldier Technical, Soldier Clerk/Store Keeper, Soldier Nursing Assistant Jobs by Direct Army Selection Rally. Army Bharti Rally in Sikkim 2015. To Get All upcoming Army Rally district wise programmes/schedule time table, Trade wise educational qualification details, age limit, Physical standards (PET/PFT), Score calculation, Written test syllabus and many more, simply like our Jobrule Facebook Page. 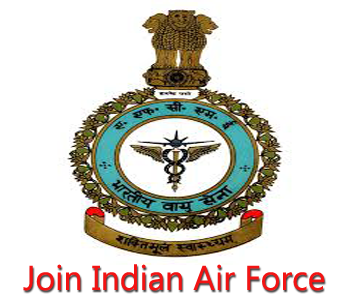 Join Indian Air Force-Become an Airmen. Indian Air Force Open/Direct Selection Rally for Group ‘X’ (Technical) and Group ‘X’ (Education Instructor) trade at 4 Airmen Selection Center (Near Palta Gate) ,Air Force Station Barrackpore, North 24 Parganas, West Bengal from 08/11/2014 to 16/11/2014. Indian Air Force offers opportunities for Unmarried Male Indian Citizens from the designated districts of State of West Bengal (WB) and Sikkim to become Airmen. 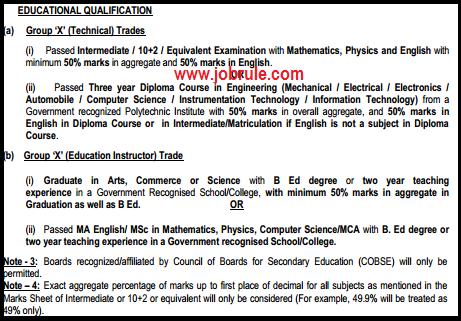 The Recruitment test for Group ‘X’ (Technical & Education Instructor) trade will be held at 4 airmen selection centre (Near Palta Gate) ,Air Force Station Barrackpore, North 24 parganas, West Bengal from 8th to 16th November, 2014 as per below given schedule. The recruitment rally will be conducted from 7 A.M onward as per schedule. The recruitment test is not for selection as commissioned officer/Pilots/Navigators. 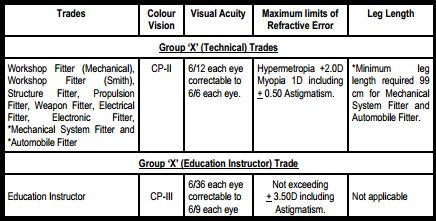 Writtent Test and Physical Fitness Test (PFT) for Group ‘X’ (Technical) Trades. Check official website link to view Domicile requirement and Physical Standards for Physical Efficiency Test.